Some time back I read a blog by a youngster about the things he stored in a big sack back home which his mother was not allowed to go through or even touch. They contain, he wrote, valuable things which still mean a lot to him, like that twelve year old rusted headlight of his bicycle, keys to open he knows not what, notes which he now cannot decipher, a toothpaste cover with ‘something‘ written on it, colored paper, pencils, crayons, game CDs, old speakers and such other priceless things. Junk??! How can you think of calling them junk?? How wonderful it must be when he goes home and relives old times among this treasure! It probably gives him even more pleasure trying to figure out why something was considered valuable and safely tucked away in his collection back in the good old days, like the toothpaste cover with something written on it which something he has no clue about now. Trying to decipher that something itself must be pretty much fun. I can very well understand his thrill for I too had been a collector of valuable junk and had a fair share of them tucked away during my own youth. Some of them were found and ruthlessly thrown away by mother on a regular basis without my knowledge. Comics and story books were given away disregarding vociferous protests when we moved places (due to father being in a transferable job) unless of course hidden safely among school books. I had not only to cut down my prized ‘junk‘ to the barest minimum, but also make sure what I thought precious passed through mother’s hawk eyes without getting confiscated and unceremoniously thrown out as useless junk. Still, as the ‘Expert Packer’ of the house (which title I retain in my own Home Sweet Home even to this day) who manages to pack maximum things in minimum space, I was entrusted with duties which helped me smuggle out whatever I wanted without anyone knowing about it. This way, I managed to hold on to at least some of the junk I possessed. I suppose only those who don’t have reason to move from place to place can really and truly enjoy the absolute luxury of owning valuable ‘junk‘! When I became an army wife, the gypsy life style of my childhood became mine once again. But now, I was the one in charge and had to restrain my family from accumulating what they thought valuable junk and which would make our luggage cumbersome to carry from place to place. Setting a model to the rest of my family, I threw out most of the valuable ‘junk‘ I owned and encouraged them to curtail their treasures to the minimum. Of course having been a junk collector myself, I was more sympathetic to their cause than mother had been and most times let them have their way. Hmmm… but did I just say I threw out all the junk I owned?? Pretty much the truth because the old junk went out the back door and I now started accumulating new ‘junk‘ on the side!! Among my treasured ‘junk‘ as it stands now is a ten-rupee coin that my husband gave me in 1982, the year we were married. Then there is that trunk full of letters and cards that we have been sending each other all these past years, letters which are the lifeline of any Infantry man’s wife. Along with these, I also have a few baby dresses worn by each of my sons (Bob my good friend says they are way too handsome young men for me to be referring to them as monkeys in my posts! ), the glass they first drank from, a lock of hair from their respective little heads taken the first time they had their haircut, the first tiny bangles they wore, their first written word, their drawings, water colors, test papers they did at school, cards they made for me or bought for me, little notes and other assorted items. The picture below is of one such note, a prized possession of mine, from the junior son written when he must have been around six to six and a half years of age. Do forgive his poor spelling. The junior son had been a great cricket fan those days and a good player too. Even the older boys used to let him play with them. His bowling prowess at the time was in the forefront rather than his batting side. The flip side to this was that he was always playing ball inside the house, trying out his bowling skills, in spite of innumerable requests and warnings to not do so. Stressed and overworked that I was, I had had enough of it one day when he broke something yet again. I gave him a good (well I am sure it was bad if you look at it from the little fellow’s point of view) spanking and sent him to his room. “Don’t call me Amma (Mom) if you don’t care to obey me! !” I added for good measure. After some time a head popped into the room I was in. He quickly walked in, left a folded paper in my lap and without saying a word went back to his room, not before giving me a reproachful look. What the note says is simple. It is addressed to the ‘greatest’ Mom (who else but moi?!) and conveys that since I asked him not to play in the house, he wouldn’t. The next part in Hindi though a bit ambiguous, simply expresses his hurt that I told him not to call me Amma (Mom) and also mentions that I had spanked him too hard. Lol @the cat that prefers furniture. Good luck with the Diwali cleaning! Wow! What an adorable letter that was… reminded me of my younger days ..when i had fainted when my mom slapped me for not doing homework..
Me: Thanks Aditya. Ahemm, in my house I am the junk thrower… actually the Lord and Master is a hoarder par excellence and if he had his way we wouldn’t have any space to live! *rolls eyes* So I periodically throw away junk, but nothing of sentimental value mind you, the smaller in size it is the greater the chances of it remaining in the house and not thrown outside. But I do have my ‘little’ hoard tucked away! This brought tears to my eyes.I too carry some valuable “junk” wherever I go. You are right they bring back some precious memories from the past. going through them gives a high of a drunk. A bell strikes in my memory with a clunk. This write-up certainly moved and strummed a few sentimental notes in me. It is a priced possession you have, the note from the junior son, and the feelings behind, the innumerable thoughts and…what not. I feel,Junk has an air about it, an aura made up of the perceiver’s kinship or attachment or association with certain memories…scraps of leftovers of a time gone reluctantly by .I had my own collection, a top broken on the sides, a few well shaped pebbles of varied sizes, played–and-smashed marbles of different colors (which accompanied me where ever I went, away from home, when I was just twelve). ‘The valuable junk’ has a great universality about it and you have ‘treated’ it most aptly and enjoyably . This post is priceless… !!!! simply priceless Shail !!!! I have my junk stored at our house (headquarters as we call it) right now I am living in a branch.. but already I got a call from my Mom who was asking if she should clean my cupboard for Diwali.. !!! and the answer was NO !! I will do it myself.. !! those days of sticking posters in the cupboard… the happy friendship day cards from girls.. letters from cousins… old pen friends… sigh… !!!!!! I am looking forward to going and re-organising everything and cleaning up !!! mind it cleaning up not dumping anything !!! Talking of “valuable junks”, I too have kept one for long. A small metal box with sharp edged holes on top, a scraper of arecanut, used by my father. Dates back to 1961, almost half a century of eventful years, which we could not share with the loving soul…..
Well written and your articles makes the reader nostalgic and sentimental. Ahhh… so much emotion in that little piece of paper. 🙂 Sweet post..I don’t have anything of my own to preserve except for some vague memories-both good and bad..I ahve always been (and still is) fearful of tresuring things,as i don’t like and is afraid of others peeping into my privacy and space..So i choose not to preserve any of them ..
Me: Thanks Nimmy. Ahh I know what you mean. i am fiercely possessive about my privacy and space too. If I see anyone messing around with my privacy or space , they’d probably freeze to death coz of the chill in the air. 😛 I have seen that in most all average households women as daughters/wives/mothers are not allowed space of their own or privacy in any matter except the basic, but the other gender shouts from the rooftops about needing space and privacy if so much as an innocent question is asked. That is so precious and adorable! When we are at the end of life, such little things are what we remember most. I think I have read your post on hoarding and commented that I don’t hoard much. I really don’t hoard that much, just a few things. 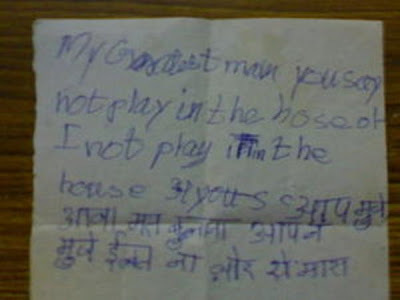 Cho Cho Chweet :-)I would love to have a cute note like this from my child!! Shail, brother and I used to call our mom ‘Hitler mom’. Ha..ha..ha.. now my mom is also ‘Baaaaa-Lamb mom’. As “beauty” is in the eyes of the beholder, so is, I suspect, “junk”–a valuable lesson we must be reminded of. Very sentimentally and well written, a piece of family history definitely needing to be preserved. Me: Right you are Bob. ‘Junk’ is valuable to the person who holds it.